Good Garage Scheme Car Servicing in Great Britain : Good Garage Scheme hears chocolate gives Ford inspiration in new technology. Good Garage Scheme hears chocolate gives Ford inspiration in new technology. Nestlé’s Aero has been used as a source of inspiration for engineers at Ford in their pursuit of a new way of reducing vehicle weight. The new idea aims to reduce emissions while simultaneously increasing fuel economy, without sacrificing durability. MuCell (microcellular plastic foam) technology, born at world famous technology institute MIT, has been developed by the formation of millions of micro bubbles similar to that of Aero chocolate bars by the injection of gas during moulding. The process reduces the overall plastic content used on components by up to ten per cent. Next year’s Focus is expected to be the first model manufactured with the new technology. Ford aim, with this technology, to reduce the weight of their vehicles by between 100 kg for their smaller models to up to 300 kg for the larger vehicles in their range within the next ten years. 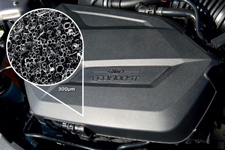 Initially, the technology will be seen on engine covers in models released in the next few years but other parts of their vehicles could see the process applied to them.